The drama workshops we run are a great way to get students speaking English freely. Robert, who has travelled worldwide using drama to teach English as a foreign language, runs the classes and his approach encourages students to have conversations in English, with him and with each other. 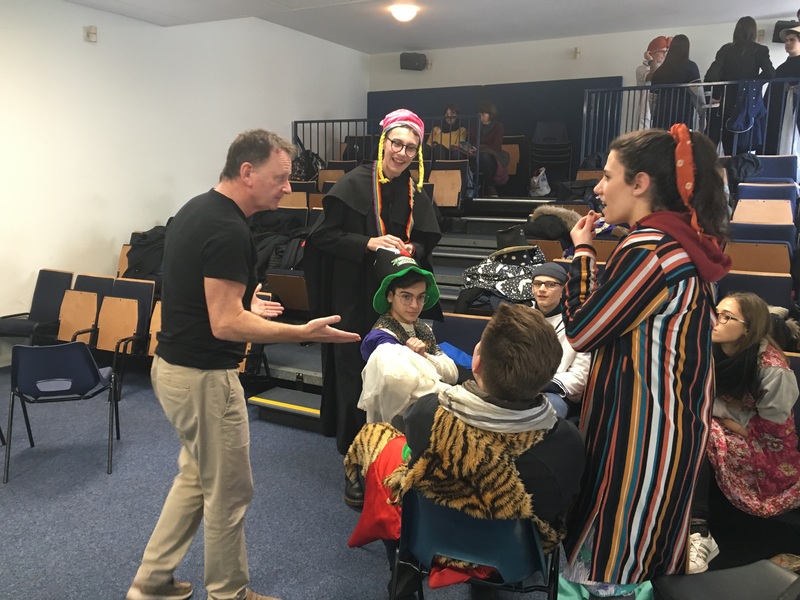 In all of his workshops, Robert offers props and costumes to students to help them come up with ideas for their story and makes sure to spend time with each group finalising their ideas and help with ways to communicate their story. This group particularly enjoyed using the props and costumes! In February we were joined by an Italian group who were here for a special ‘English and drama’ week. They took part in the workshop offered to all groups, which involves students working together to create a short story which they then act out and present to the rest of the class, in English. This is always a popular activity as it gives students the chance to have fun with their friends while still practising their English. This group then had a second workshop which also involved storytelling in English but focused on helping to recognise a deeper meaning behind words. Robert tasked them with creating a character and then acting out this character at different ages, starting at four years old and then every seven years. He really wanted the students to focus on the changing emotions and characteristics that one person might experience at different ages; such as being nervous about starting school at eleven – how would their being nervous affect them in terms of what else they feel and their body language? Although each student had to portray their own character, they worked together in groups, which allowed them to discuss the potential emotions and the best way to communicate them using English and then through acting. The focus on drama really made a difference to their week, as the freedom within the workshop allowed them to get to grips with English language.